The Sky+ app for Android has been updated, letting you use your phone or tablet as a remote control for your Sky+ HD box. Swipe your Android device's screen, and you can change channels, pause and rewind live TV, and add or delete recordings. Just connect your Sky+HD box to the same Wi-Fi network as your Android device, and you're good to go. Previously, the feature was only available on the iOS version of the app. 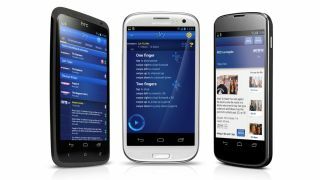 Those using the Android version were relegated to checking the TV guide, setting their Sky box to record from wherever they were in the world, searching, using series link, and a few more features. If you want the new features, you'll need a device running Android 2.2 Froyo or later. Which is pretty much any Android device released since 2010. If you're still stuck on 2.1 or earlier, you won't be able to update to use the new functions, though the old app will still work. The Android version of the app has been playing second fiddle to the iOS, seeing as iPhone users have been using the remote control feature since November. The iOS version also lets users browse on-demand programmes, and download box sets remotely. Sky has promised on-demand listings will come to the Android app later this year.